Y-PLAN is designed to engage young people to create healthy, sustainable, and joyful cities. The following tools provide a lens for students to work with adult allies to critically examine their everyday environments and approach the Y-PLAN project question. Y-PLAN is grounded in the fields of urban planning. There are four interrelated elements or “strategies” that planners use to improve the quality of cities: (1) housing, (2) transportation, (3) public space, and (4) schools, services & amenities. Select the buttons below to learn more about each of these Y-PLAN project elements. n. Structures that provide shelter for people and families; defines local communities; and determines access to jobs, services, amenities, and support networks. Having stable housing has positive effects on our personal well-being and education and provides a way to nurture vibrant communities. Housing is also important because it provides access to various amenities but can also expose us to harmful toxins. Property taxes that come from homeowners also form an important tax base for cities and counties. That tax base pays for schools, transportation systems, roads, health clinics, police and fire departments. In many cities and counties there are concentrations of wealth or poverty based on where people live. This is because of historical policies, such as redlining or exclusionary zoning that created segregated neighborhoods based on race and class. Though these policies are illegal today, we still find remnants in our cities today. All cities should provide housing that is affordable to people of all income levels. Without access to affordable housing, people who work in lower wage jobs are forced to travel longer distances, which is expensive and time consuming. Moreover, everyone deserves to live in a home where they can nurture their talents, explore new interests, enjoy the company of their friends and family and feel safe. City governments play a powerful role in ensuring that all of their residents have access to safe and secure housing. Single Family Housing is designed for one family, usually between 1-5 people. Multi-Family Housing is designed for multiple families. Apartment buildings, duplexes or condominiums are types of multi-family housing. Market-Rate Housing refers to homes that are built without any direct government assistance or subsidies. Public Housing is housing that is built and maintained by the government. Housing Subsidies are different ways that the government assists either low-income residents directly (Section 8 for example) or developers who wish to build housing for low-income residents. Mixed-Use Housing are homes that are often built as “multi-family” housing units with a blend of commercial, cultural, light industrial or institutional space, usually on the ground floor. Area Median Income (AMI) is the median income in a geographic region. The AMI divides the population between those who earn above and below the median income. The AMI is used to calculate what is “affordable” in each city. Generally, it is thought that 30% of a family’s income can be spent on housing, so if all of the market-rate housing would cost a family more than thirty percent of their income that family should qualify for below market-rate housing. Subsidies are grants or governmental assistance that is used to offset the cost of developing a housing project, transportation infrastructure, service, program or public space. Does your family live in a neighborhood with mostly single family or multi-family housing? How long does it take your family to get to school and work everyday? Are there any factories or major roadways that emit or dispose of waste in your neighborhood? What are ways that your neighborhood supports a healthy lifestyle? Or not? What are ways that your housing support the needs of your family? How doesn’t it? Find the your area median income by clicking here: http://www.huduser.org/portal/datasets/il.html. Calculate 50% of AMI and 80% of AMI for your area. 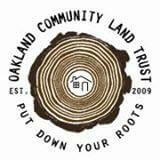 The initial project of the Oakland Community Land Trust is based on Neighborhood Stabilization Program funds from the City of Oakland, and involves the acquisition and rehabilitation of vacant and foreclosed single-family homes in Oakland. These homes will be sold to working families earning between 50 and 80 percent of the area median income and will remain affordable to people in this income range forever. Benefits: The Lincoln Institute of Land Policy found that in 2010, Community Land Trust homeowners, nationally were less likely to be forced out of their homes because of foreclosure. For Oakland, the OCLT has meant that foreclosed houses remain available for low-income residents. Challenges: The land is owned by the Community Land Trust, which can add to complications if a homeowner chooses to sell the home. In Oakland, which had many foreclosed properties the OCLT could only buy up a small amount of properties. In many communities, land trusts have a limited capacity to address the issues that arise with hundreds of foreclosed properties. n. The system of bikes, cars, buses, ferries, trains and walking networks (or any other mode) that we use to get from one place to another. Whether you use a bike, the bus, a plane or your feet, transportation systems get you where you need to go. Reliable and safe transportation options are necessary to ensure that we can spend most of our time doing what we love to do or need to do and less of our time getting there. Unfortunately, for many people safe and reliable transportation can be costly or unavailable. Typically, it is thought that households spend about 10% of their income on transportation. However, as people move further and further from their jobs and loved ones, many households are spending more than 15% of their income on transportation. Combined with average expenditures on housing, families can spend over 45% of their income on housing and transportation, leaving little room for other household needs and activities. Another aspect of transportation systems are their impacts on the environment and our health. Our transportation choices can have both positive and negatives effects on both the environment and our health depending on, which mode of transportation we use. Transportation systems, specifically those that involve cars and trucks, are primary contributors to air pollution, water pollution, wild life habitat destruction and climate change. Those environmental changes also impact our health by exposing us to toxins that have been shown to increase our risk for injury or diseases such as asthma and cancer. Yet, transportation also plays a critical role in ensuring access (Healthy People Healthy Places), to healthy food, our friends and loved ones. Choosing to walk or bike also reduces our risk for obesity and high blood pressure, stress, depression and makes it easier to sleep. But we only have that choice if tour hometowns have the appropriate infrastructure to make walking, biking and use of public transit possible. Public Transportation is any transportation system that is run by a public agency. The most common form is usually the bus or subway but can also include ferries, trains, bike shares). Transportation Infrastructure refers to the network of roads, vehicles, stations, stops…that make driving, walking, biking or using public transportation possible. Subsidies are grants or governmental assistance that is used to oset the cost of developing a housing project, transportation infrastructure, service, program or public space. Connectivity is the ability to be connected to multiple places or resources. Mode Share refers to the distribution of transportation choices each city or region makes available. What mode of transportation do you use to get to school? Do you use different modes for different activities? What transportation mode do you prefer and why? If you live in an area where cars are the dominate mode of transportation, what are two ideas to get people to use other modes of transportation? Do you have access to any apps or technology that supports your use of transit services such as waiting time information, online or trac congestion maps? How have those change your use of transit services? Figure out your carbon impact: Nature Conservancy Carbon Calculator. Teachers, check out this project from UCLA’s Institute of Transportation Studies to get ideas for developing research projects about transportation experiences. The initial project of the Oakland Community Land Trust is based on Neighborhood Stabilization Program funds from the City of Oakland, and involves the acquisition and rehabilitation of vacant and foreclosed single-family homes in Oakland. These homes will be sold to working families earning between 50 and 80 percent of the area median income and will remain affordable to people in this income range forever. On Earth Day 2013, Dallas/Fort Worth opened their Bike Sharing Program, bringing over 300 public bikes and 30 docking stations to the Southside and Cultural Districts in central Dallas. Users can either pay $80 a year or $8 for a 24 hour period. The Bike Sharing program is a major boost to build up Dallas’ existing bike infrastructure. Benefits: Bike Shares, offer an easy way to move around cities that reduces our carbon footprint and promotes our health and well-being. Most importantly, riding a bike is fun. Challenges: Bike shares often start out in areas with high tourist traffic or central business districts and in some cities, struggle to expand. If the bike share is only located in a few neighborhoods, the system can remain out of reach for many residents. Usually a yearly pass is designed to be affordable for most residents but daily fees are high for tourists. This can mean that residents who don’t pay for a full year have to pay steep daily prices. Moreover, not every family can afford the yearly fees making the need to think through support systems for low-income residents an important piece of any bike share plan. n. Physical places that are owned by us (the public) and free for anyone to enjoy. Public spaces give residents opportunities to meet each other, to play with their children or just hang out. They should not cost anything to enter and should feel inviting and safe. In many cities, they are important spaces for political demonstration, which has been a critical component of American social movements. For example, the National Mall where Martin Luther King Jr’s March on Washington took place. Public spaces can very large like city parks or as small as the sidewalk in front of your house. Some of the bigger public spaces, such as Central Park in New York have become defining features of a city and are places that people come from all over the world to see. One popular trend is small scale changes or interventions to unused city space. Sometimes these changes are sanctioned by the city and sometimes a group of residents decide to take it upon themselves to change the character of an unused space. Small-scale interventions can be sidewalk garden plots, putting up a swing in a tree, fixing up a vacant property or even just cleaning up a space to make it more usable. They can also be more significant like putting up a “pop-up” theater or creating a "pocket park". In some cities, public spaces are increasingly becoming sites of civic attractions and are often turned over to private entities to run and manage. There may be benefits to this arrangement but you should also always investigate the limitations, such as: Who is or is not granted access to that space? Does the space cost money and is that cost prohibitive for low-income people? Place Making is the process of creating a place into what you want it to be. Streetscape is the appearance of a street (e.g. The streetscape was improved by planting trees). Paths are the streets, sidewalks, trails, etc. that people walk along. Edges are perceived boundaries such as walls, buildings, and shorelines. Nodes are focal points or intersections. Landmarks are objects which serve as external reference points. Scale refers to the size of an object or project. For example, Central Park is a large scale project while a sidewalk garden is small scale. Mixed Use refers to spaces that serve multiple purposes. A Square Foot (ft2) is the unit most commonly used to measure spaces. A tile that is 12 inches by 12 inches has the area of a square foot. Infill refers to developing underutilized or vacant sites in areas that are already built-up. If you are looking for more resources on basic design concepts, check out Image of the City or City Sense by Kevin Lynch. In almost every school there are spaces that act like public spaces in cities. They might be places where you eat, where sports teams practice, or where people just hang out. Take a piece of paper and draw one of those spaces. Make notations about the different components of the space (paths, edges, nodes, landmarks, etc.). Where do people walk, sit or stand? How do people use the space? Is it used as it was designed? Write out how you feel about the space. Assess the square footage of that space. Using the same questions above describe a public space in your neighborhood or city. Is this public space occupied throughout the day or just during certain times of the day or week? What brings people to this space? How do people get to and from the site? Though many great public spaces have been formally planned, not every public space is planned by designers and city agencies. 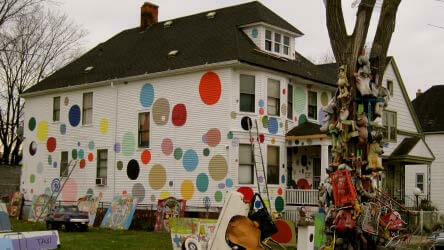 The Heidelberg Project, in Detroit Michigan is one such project. The project was started 26 years ago by Tyree Guyton, who grew up on the block and turned to art after loosing three brothers to street violence. Tyree and his grandfather began by cleaning up the vacant lots around his childhood home. The waste from the lots became the items used to turn dilapidated houses, into cars gigantic sculptures. Over the past 26 year period, the entire streetscape was transformed into a mammoth art installation. The project is used to teach students about art and community development. Benefits: Good urban design can transform underutilized or poorly used spaces into extraordinary places. Particularly, when design is combined with investments in the economic development and resident well-being, urban design can lead to catalytic change. In the 26 years since the Heidelberg Project began no serious crimes have been reported on that street. Good urban design should contribute to safer streets, improved connectivity and create spaces that offer inspiration and joy. Challenges: Any design project poses multiple challenges. One of the biggest challenge for designers working on projects of any scale is creating a design that adequately responds to the way many different people use a given space. A secondary issue is there is a belief that by changing the way something looks people who use the space will change their behavior for the better. While it is true that improving street lighting can increase safety or building a recreational track will encourage people to exercise, assumptions about the capacity of urban design to solve social problems is often blown out of proportion. Making sure you really research the needs of different groups of people, make astute observations and pairing your designs with other kinds of supportive programs will give you a solid foundation to conceive your design. n. The combination of programs, activities and urban design features that enhance the quality of life for residents and visitors. Having access to high-quality education, excellent healthcare, spacious recreational facilities and healthy food are things that every child deserves. Providing the foundation for great schools and the complementary services and amenities students need are some of the primary responsibilities of school districts and cities. Services and amenities are the support systems and businesses we depend on, spaces where we recreate and the places that provide us opportunities to learn and grow. When our neighborhoods and cities ensure access to great schools and services, our health, education and quality of life improves. When there are barriers to great schools, services and amenities or they are unavailable in our hometowns, we either have to create alternatives or organize to get what we need. Many communities create their own services and amenities. Maybe one of your neighbors has a garden where you can pick food or has set up a basketball hoop or skate ramp in places that lack recreational facilities. Whether set-up by the city, a non-prot or residents, all neighborhoods should have a range of resources that enhance the quality of life for those who live there. Amenities are the physical or social aspects of a neighborhood that makes it attractive, convenient or comfortable. Formal Services are programs that are set up by government, businesses or non-profit agencies to serve the needs of a particular population (such as children) or all city residents. Informal Services are programs that are set up by an individual or community members to serve residents. Many informal services that have a proven track record or ll an unmet need can become formal over time. Joint Use Schools are schools that share their land and facilities with groups, agencies or non-profits to support an array of community needs. Full Service Community Schools are school partnerships that aim to integrate education, youth development, community development, health and social services. Recently, the US Department of Education started its own Full Service Community Schools Program. What are areas or neighborhoods that you enjoy the most? What are different programs that you are involved in outside of school? What are different programs or services that your family can readily access? What programs, services, activities or amenities are missing in your neighborhood? 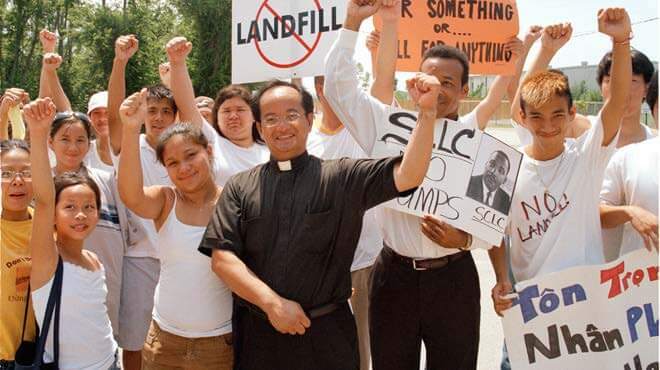 Versailles, New Orleans first made it’s way into the national spotlight when A Village Called Versailles, a film documenting the organizing and rebuilding efforts of the Vietnamese community in the wake of Hurricane Katrina, was released. 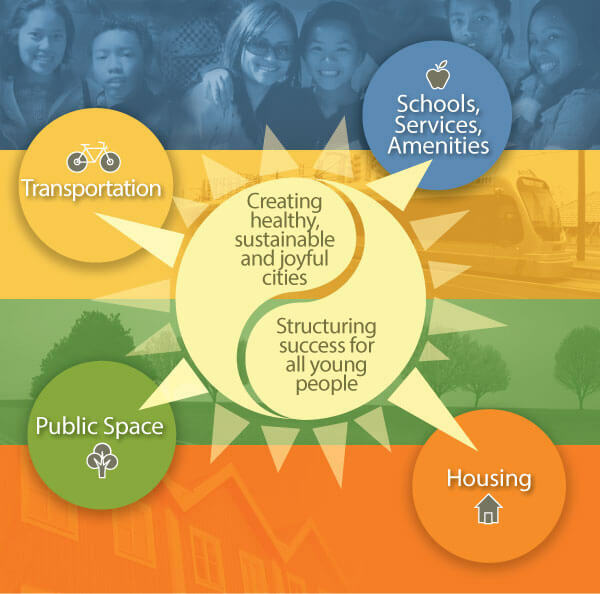 In 2005, Queen Mary of Viet Nam Community Development Corporation began a neighborhood planning process that included surveys, focus groups, one-on-one interviews, community meetings and a design charette. QMVN now runs an array of programs that aim to serve the New Orleans East community, which includes a substantial Vietnamese community along with many African American and Latino families. Services include health and social services, programs for youth, business development, agricultural projects, technical assistance for those impacted by the BP Oil Spill and an intercultural charter school. Benefits: Schools, services and amenities are the backbone of communities. Well coordinated organizations such as QMVN provide the support systems that are responsive to the social, cultural and material needs of residents at a local level. Challenges: Communities that face compounding challenges often struggle to find the resources, services and programs to truly meet the needs of all of their residents. Even when neighborhoods have many different services, lack of basic infrastructure (such as quality transportation, economic development strategies…) or poor coordination between different programs can disrupt the intended outcomes. Schools face innumerable challenges as well. Because city governments and school districts have separate governance structures, one of the largest obstacles to ensuring great schools, services and amenities are the limited channels for communication or large bureaucratic hurdles between the two entities.